Anyone is still tempted? Preordering stops on Friday, 15. September. Meanwhile details of the (initial) CPU have become available. It's a quad core POWER9 feat. SMT4 (4 threads per core, so all in all 16 threads) at 90W TDP. The heatsink is designed to cope with the more powerful CPUs available later too. The board has fan control. <-- Which were important details for me. Totally confusing CrowdSupply post by Raptor Engineering. Price now $3700 with cpu and some accessories? Talos or TalosII? Power8? Power9? Now available? Shipping in November if ordered now? I can't decipher this crap, and it does nothing for my confidence. With only 16gb memory and without the external 8 port LSI the price is $3510.00. A bit more than an X5000 cost I think, but so much more powerful, and probably less problems (I would hope). I wonder how many of the MorphOS Dev. Team members are looking at that Power9 board and wishing that they could port MorphOS to it, but do so with a break from our traditional Amiga compatible version of MorphOS, so they could run on all 16 cores (more if/when a 2nd CPU is installed). Certainly, a port to this ultimate PPC desktop system would be faster and easier than porting to the x64 architecture, and possibly it could be a good step toward an eventual transition to x64, while providing a huge performance increase, and allowing the Dev. Team to concentrate on less things at one time, than trying to practically start over from scratch, with the current proposed port to x64 architecture. I'm just saying that maybe it would be easier to stick with PPC and write a version of MorphOS that is NOT compatible with Amiga binaries, that also provides full 64bit memory space (heck, even just providing full 32bit, instead of the 31bit we have now would be a huge improvement), providing memory protection, and SMP, all on PPC hardware that is already supported (like the G5 PowerMacs, which are 64bit systems), or this Power9 board, would be less work than doing all of the above, plus the added task of switching endianess, with the move to x64 architecture. The added benefit would be that we might be able to continue to use some of the native MorphOS PPC software (maybe not, since all existing MorphOS native software is running on an API that is Amiga compatible?). Seems I might have written something like this before, and I may be repeating myself. Someone may have already explained to me why my idea is not possible, and that the switch to x64 is NOT more difficult, once the break away from the Amiga compatible API is made, and that sticking with the dead PPC hardware platform offers zero benefits. I don't know, because I can't remember sh!t! MorphOS - The best Next Gen Amiga choice. If that was/is the plan (64Bit/SMP non compatible PPC-MorphOS as a step towards x64) it would make much more sense to just use the G5 quad. No real big difference (in terms of OS development) wether you have 4 or 16 cores, and with the quad you'd have a starting point with 32Bit MorphOS either already working or only needing some minor tweaks. I wonder how many of the MorphOS Dev. Team members are looking at that Power9 board and wishing that they could port MorphOS to it, but do so with a break from our traditional Amiga compatible version of MorphOS, so they could run on all 16 cores (more if/when a 2nd CPU is installed). I wouldn't be too surprised if that number was actually zero. Talos II sounds like a fun toy to play around with but that is about it. What you are describing is a reasonable approach for developing and testing prototypes of a next generation MorphOS. However, there is really little point in taking the time to polish everything and produce a version that is ready to be shared with end users and third party developers if you can just push ahead and go for an architecture that has far more long-term appeal in the consumer / enthusiast space than PowerPC / POWER does. If you produce a "stop gap" release for selected PowerPC systems, then you risk facing a second compatibility break as soon as you switch processors again or being required to deal with fat binaries or similar options to ensure people can run the same software on multiple processor architectures. These things can get complicated very quickly. Ideally, MorphOS can be run on a variety of hardware choices that cover a reasonably wide spectrum of price points. As reasonable as the Talos II pricing appears to be compared to other server-class hardware options, there are no publically known plans for entry-level hardware options using the same core processor architecture. So, while Talos II looks interesting enough, it represents just a tiny piece out of a much larger set of missing puzzle pieces. As said, it's just 4 cores, but 16 hardware threads. I guess some adaptations in the source code to accommodate to new/altered API functions would have to be made. Yes, I totally agree from a user standpoint, but thought that maybe one or two of the MorphOS Dev. Team members might be still very fond of the PPC architecture, and that they might like to have an "Ultimate" PPC desktop system, such as the Talos II, to run the PPC version of MorphOS, even after they make the switch to supporting x64 architecture. Porting to the Talos II would never be a rational thing to do as far as choosing a system for the users to buy. It would only be a selfish choice for whom ever wants such extreme power and speed, plus the PPC architecture, and I have no knowledge that any of the team members care which architecture they are coding for any more. Maybe none of them care about PPC any longer, and they are all looking forward to leaving it behind (other than maybe some support patches), when the switch to x64 is completed. My only point was that it might be easier to complete a version of MorphOS on PPC which has SMP and memory protection, but breaks all backward compatibility with the Amiga API, instead of creating a new MorphOS with SMP and memory protection, while at the same time moving to a different architecture. If this approach actually creates extra work and is of no benefit toward eventually creating a SMP and memory protected version of MorphOS for x64, then I would not propose for such extra work to be done, only to provide a PPC version of MorphOS with SMP and memory protection for current users on their existing PPC hardware. I only mention these things as a suggestion, because we have very limited man power, and all of the team members are used to working on the PPC hardware so far, with all current and previous versions of MorphOS, so maybe it would be easier for them to create a new OS with SMP and memory protection on the platform architecture they are familiar with (when working on MorphOS anyway), instead of trying to create a new OS with SMP and memory protection, while also trying to port as many features and look of our existing MorphOS, to the x64 architecture. Edit: What I am actually hoping for, is for the new x64 version of MorphOS, to be so lightweight and fast, that when web browsers and office suites are ported from Linux, or Windows, or MacOSX, to MorphOS, the same program will run faster and better, because there will be much less bloatware slowing down the computer. I am hoping for something similar to when us Amiga users could emulate a Mac on our 68030, or 68040 accelerated Amigas, faster than a real Mac computer could run, using the exact same CPU. Yes, that might be done as an interim step, but as ASiegel said, such version would maybe not be released as to avoid an additional compatibility break, i.e. in addition to the one caused by the ISA switch. Well, one thing that Power 9 would give us that X64 won't do as well is run our current software. Its simply a matter of lower translation overhead. Power 9's instruction set is related to PPC, and X64 is completely different. Raptor's board IS a bit overpriced, but if a larger than ATX, 2 socket board can be built for only a few hundred more than an X5000, couldn't a 1 socket ATX board be built for less? And, yes, the G5 could be used as a starting point for 32 or 64 bit MorphOS. So while I understand the X64 argument, moving forward with Power would be more evolutionary. > Power 9 would [...] run our current software. > more than an X5000, couldn't a 1 socket ATX board be built for less? Less than the dual-socket EATX board? Yes. Less than Cyrus/X5000? I don't think so. No, I don't think it would be less than the X5000 either, but they could be remarkably close in price (considering that they are not that far apart now). And I'm more interested in what could be done as an extension of what we currently have, into an smp/32 (or 64) bit enabled future. This could start right now with the G5 and migrate into Power 9 relatively painlessly. A small production run of custom boards with a single Power9 CPU socket, might not be less expensive than the currently proposed Talos II board, because someone would still have to pay for the R&D to re-design the Talos II board to remove the extra CPU socket and wiring traces, and probably some firmware logic. That extra cost for a very small production run would probably increase the cost of a single CPU board, and such extra expense might actually make this imaginary single Power9 CPU board more expensive than the currently proposed Talos II boards. I don't know if the proposed price of the Talos II boards is enough to recoup all of their design costs, as who ever paid for such design costs, might be writing that cost off as a non-recoverable design expense, similar to what Trevor and A-Eon did with the X1000. My imagined evolution of a version of MorphOS with SMP and memory protection on PPC (breaking compatibility with Amiga 68k API) would still be able to run some, or most of our current software via a sandbox/emulation on only one core, which I would imagine might be easier, or better to do on a Power9 CPU board, than it would be on the x64 architecture, but since I have no idea of what amount of work it takes to do any of these things, I am just imagining in the dark. Like I got from #talos-workstation on IRC ordering the systems/boards is still possible. Orders placed now will be processed during Q1/2018. Orders in the phase closed on 15.09. will be processed Q4/2017. "POWER9 variants can ship in versions with some cores disabled due to yield reasons, as such Raptor Computing Systems first sold 4-core chips, and even IBM initially sold its AC922 systems with no more than 22-core chips, even both types of chips have 24 cores on their dies." From what I gathered on IRC #talos-workstation, the quad-core has a TDP of 90W, the octa-core 190W TDP. Both of them can clock up to about 4 GHz, with 10MB 3rd level cache per core. > the processors, which one controls the third X16 slot? 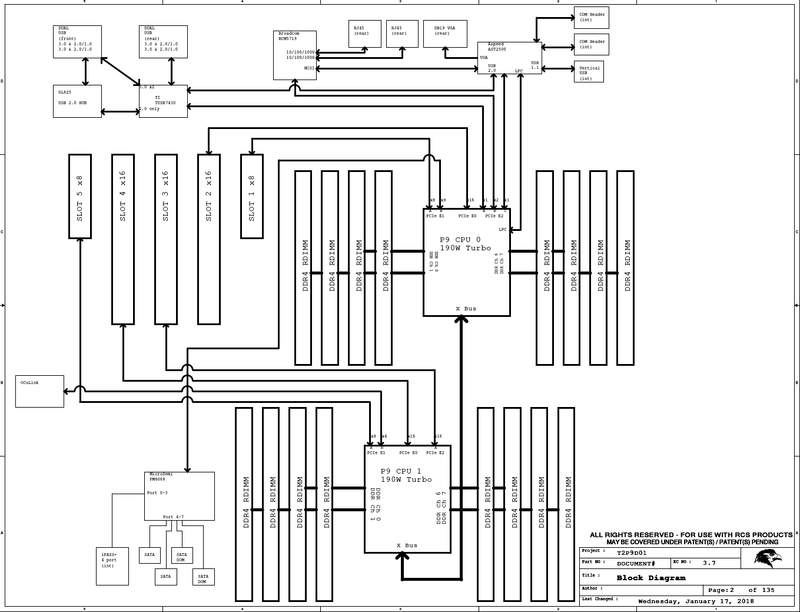 While the used Sforza module provides 48 PCIe lanes per chip, which in terms of figures would have allowed for CPU1's x8 slot to be connected to CPU0 instead, it can only connect to up to 6 PCIe endpoints. The connections to SAS/SATA, Ethernet, USB and BMC necessary for CPU0 add up to 4 endpoints, leaving endpoints for no more than 2 PCIe slots. And as can be seen, OCuLink μPCIe won't be available in single-CPU configuration. I have been looking at the Talos II and made the decision to get one early last week. I should have enough cash in my toy box to do so in two/three weeks. I wound up here after too many hours of research on the Talos II and the POWER9 SO chip where I ran across the POWER4 (G5) and a link to MorphOS running on the G5 Mac. I have had Amiga's since the A500 and up to the X1000. When it was decided not to port MorphOS to X1000 it was a big letdown for me as I really wanted to give it go. Perhaps for the best anyway as I'm really fed up with the PC architecture, no matter the CPU. If there is interest in the Talos II here I would be happy to join in, however I think it might be a good idea to start a new thread. I hope to have a good relationship and share thoughts with many. Cool, can you keep us informed about your purchase? I was thinking about the Microsemi SAS controller but after some email exchanges with Raptor it turns out that chip uses proprietary firmware/microcode and the LSI board has open drivers. As for all the RAM. The system works best with each CPU having its own RAM. It could be 1 8GB module for each but according to Raptor the performance gain with 2 modules per CPU is amazing. Since I won't be running any kind of server or tracking asteroids in other galaxies the 4 core CPUs should be more than enough for any desktop type usage. A little info from contact with Raptor. The 2x8 pin PWR connectors are in parallel due to the Sforza lower power requirements. So I guess only one 8 wire connection is needed. Also, the top two PCIe slots are controlled by CPU0. > the top two PCIe slots are controlled by CPU0. > it looks like the POWER9 will also run 32bit Big Endian Linux. That would be cool, even under KVM to start with.